Gose was only the "other" beer in Leipzig as the original local brew for centuries was "Rastrum". Rastrum is an old word for a rake and there are different theories as why it was called so. I see no importance in that question as every town had a crude name for its beer. What is of more relevance is the quality of the beer. Most authors agree that Rastrum was brown to dark brown, sweet, cloudy and tended to go sour or even stinky fast. It is just one version of the omnipresent Braunbier (brown beer). Of cause it was top fermenting and it was fermented in wooden vessels that could stand in a cellar or over the ground without any cooling even in the summer. 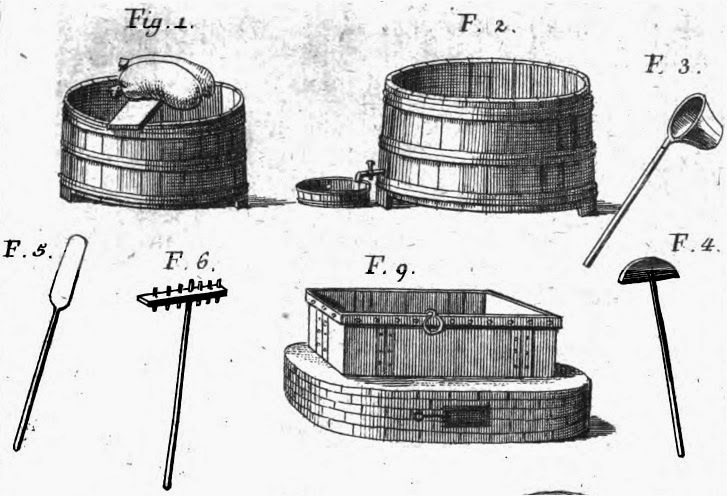 In the book "Die Kunst des Bierbrauens" (the art of brewing beer) published 1771 in Dresden, Johann Christian Simon explains how to make better beer. He explicitly refers to the lame leipziger "Rastrum" which should be improved. 6. different procedures in malting, brewing and fermenting. He does not know that there are different yeast strains, as he thinks of fermentation as a chemical process. Nevertheless he knows to point out what can cause spoilage and how to keep the wooden vessels and apparatuses clean. He also knows the word "Hefe" and about its importance for fermentation but not about its nature and breeding characteristics. He advises to bring the wort to a temperature of 25°C to 35°C depending on the ambient temperature. He also knows that too much or too little yeast is bad. Even his hints for yeast-storage seem acceptable (put them in a stone-bottle, close it with tar-pitch and bury it in the ground at a shady place or plunge it in a cool well) (193). But what if we have to get fresh yeast? Wheat flour, hops, egg white, honey or sugar? Porridge, wine, juice of sweet fruits, sourdough or rye flour? There might be a reason for his belief that after every fermentation the brew will go sour - there is only the option to slow that process down. He knows how to keep beer unspoiled is to make the barrels tight by pitching them and by storing them in fresh cellars or ice-caverns. He also says that bottled beer is three times stronger and better in its spirit (carbonation) than beer that has fermented at the air. (205-6). Düsseldorfer Alt might be the one beer of our time that comes closest to the old Braunbier. Fermented in Wood, conditioned in pitched wood or bottles. Yeast can be everything from wild yeast, bakers yeast or german ale yeast.